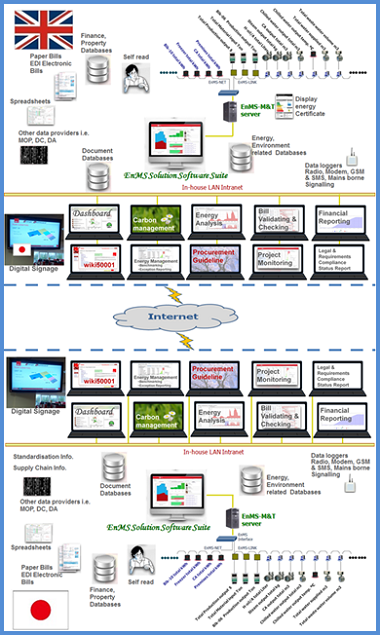 Would Japanese energy users use non-Japanese EnMS solution software? Firstly, think about your business. Secondly, think about the final destination of your products or services and life cycle. You will then realise that it is too risky to focus your business only on domestic matters if sustainablity is to be pursued. This is why we promote the use of overseas softwares to Japanese energy users as an attractive option. The purpose of employing the right software solution is not only to meet business requirements, but is to gain knowledge from the software vendor about its business background and philosophy. It is sensible to form a working partnership with the software developer to ensure your business output is in conformance with the requirements throughout the supply chain. This is the ultimate benefit of using the right software in providing your business with a competitive edge in the global marketplace. Whilst there are many EnMS software tools available, few provide an integrated and comprehensive suite of functionality, scalable to service global enterprise. Therefore we are fortunate to encounter the powerful EnMS software suite TEAM Sigma, incorporating Monitoring &Targetting (M&T) functionality developed by TEAM (Energy Auditing Agency Ltd.) of the U.K. TEAM Sigma features functions including regression and CUSUM analysis techniques, the software also provides extensive choice of "Reporting and Analysis", "Sharing information", "Query Management", "Exception Management" with useful modules such as "Carbon footprint", “Electronic Data Interchange (EDI) billing for utilities “, “Measurement and Verification”, “Project Modelling”, "Tenant Billing", "Web Dashboards and Digital Signage Solutions", etc. These useful functions also contribute toward improving business efficiency by automating routine, manual tasks. TEAM Sigma　complies with the guideline, established by the ECA Energy Technology Criteria List 2009 "Automatic Monitoring and Targeting Equipment"(EEEL) in the U.K. In particular, it conforms to the criteria detailed within the EEEL requirements for, Analytical Software (i.e.advanced Monitoring and Targeting (aM&T) Software). More than anything... what attracts us the most is that the TEAM Sigma takes a human centered approach. It is not only supports the local language but also recognise the local culture to ensure users make full use of the functionality. This enables users to take proactive approach in sharing the important and useful information globally. TEAM's expertise and global thinking are fully integrated in the software suite to deliver Internationally established techniques and standards in a manner consistent with the local market. TEAM also offers a Wiki based Framework for ISO 50001 compliance that provides a paperless EnMS Document Management System, wiki50001. 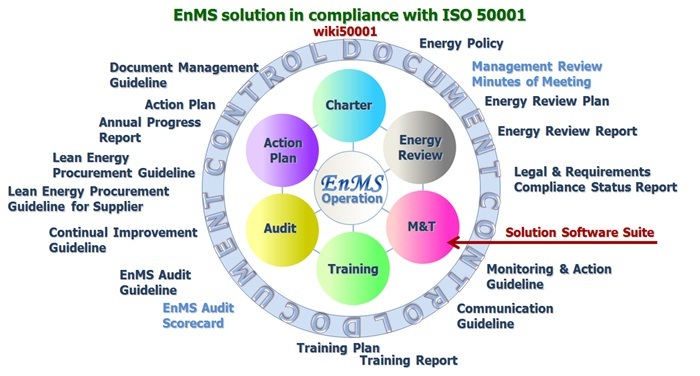 By taking up the EnMS Solution Software Suite and wiki50001, the key EnMS documents as indicated below will perform to their fullest ability in achieving energy performance improvement with the EnMS best practice. EnMS Audit Scorecard is to understand the effectiveness of EnMS operation together with gaining appreciation of the essence in the ISO 50001 International Standard. For introductory purpose, we have created a complimentary download material "Welcome to a Magnificent World of EnMS Auditing" to provide better understanding of our EnMS Scorecard.